Take this art walk and gallery-hop and enjoy the artistic highlights of the Fisherman’s Wharf neighborhood. Enjoy museum-like art galleries filled with paintings, sculptures, mixed-media arts, street performances, and public art. Don’t forget to get a caricature drawn and snap a few artistic photos of the scenic Bay views. 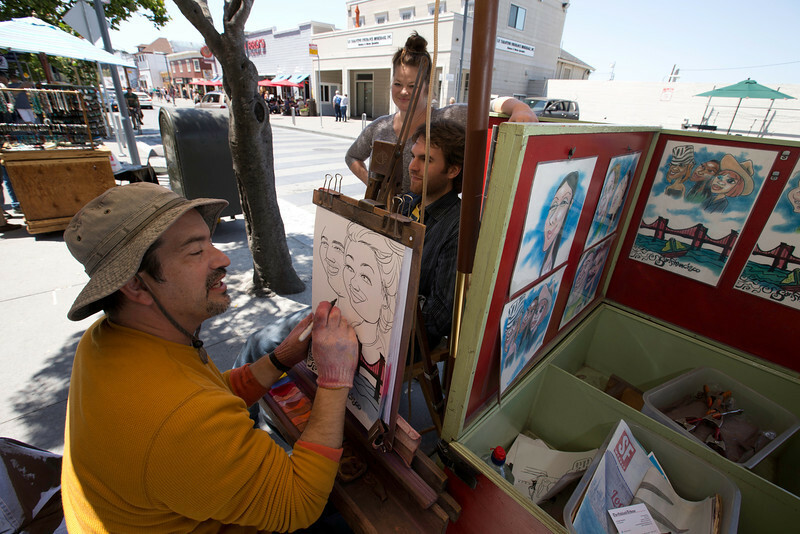 Hop off the F-line outside PIER 39 to start your waterfront day of artistic inspiration. 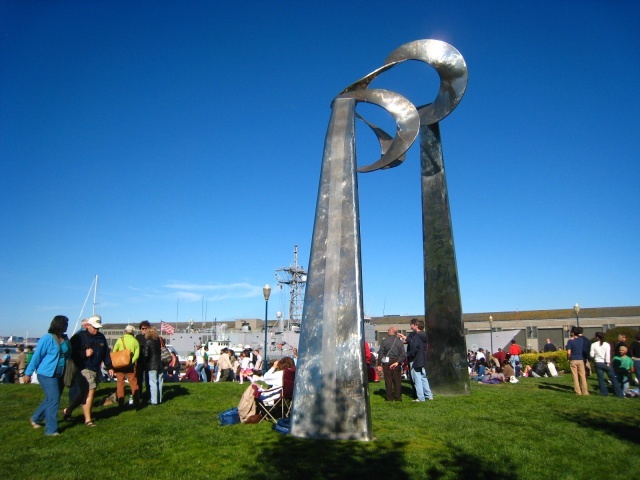 This waterfront sculpture was erected in 1985 as San Francisco’s first piece of public art financed by a corporation. The sculpture towers above the millions of pedestrians who pass by it along the Embarcadero. The work, which has been described as the “shining link between sea and sky,” was created by sculptor Roger Barr. Visitors the world over flock to Fisherman’s Wharf to experience the vibrant and lively atmosphere that the street performers-in-residence create. From musicians to acrobats, spray paint artists to magicians, the Wharf is a constantly rotating variety act. Street performers span the entire length of Jefferson street throughout Fisherman’s Wharf. You will be able to spot them easily by the large crowds that form around to watch the acts. Just past the iconic Fisherman’s Wharf crab wheel make sure to stop in Eden Fine Art because this gallery requires more than admiration of the impressive window displays. The art in this space is not afraid of color! Vibrant glass sculptures contrast against colorful painting and photography. Eden showcases the whimsical works of leading mid-career and established international artists. Many of the pieces showcase bold themes of pop-culture, celebrities, and playfully displayed words, shapes, and objects. Right next door to Eden Fine art you will find the newest gallery to the Fisherman’s Wharf district, ZK Gallery. This gallery shows the works of emerging to established artists from all over the world. The works range from traditional bronze sculpture and painting to experimental works in photography, textiles, and mixed media. After a stroll down Jefferson Street head up to Beach Street. This family-owned and operated gallery that has called the neighborhood home for 25 years, Chloe Gallery, is committed to their Bay Area roots. This art gallery sources captivating contemporary artists whose works have been shown at both the Museum of Modern Art New York and the Fine Arts Museum of San Francisco. In traditional Bay Area fashion, they also have a commitment to sustainability. The gallery has seven viewing areas that all rotate on a monthly basis. Most days you stop by you will find Amy Nelder painting in the gallery. Amy, who was formerly a police forensic artist, now creates realistic and mouth-watering still lifes of desserts and sweets. Quite a switch of subject matter! Just one block down Beach street, past the famous Buena Vista Café and cable car turnaround, you will find one of the Wharf’s most popular galleries. 2014 marks Franklin Bowles 40th year at the Wharf. This gallery focuses more on painting than sculpture and exhibits works from some of the world’s most renowned artists including Picasso, Dali, Chagal, Lewis Carol, and Leroy Neiman. This modern open space can be an inspirational oasis away from the hustle and bustle of the busy neighborhood. Despite the high caliber world-class artists, the staff at this gallery are very approachable and will welcome you into their space with warm smiles and friendly conversation. Head across the street and take a step back into the art deco era at the Maritime Museum. The building is a showcase for art created during the 1930s. Artist Hilaire Hiler spent two year in the late 1930s creating 5,000 square feet of interior murals. The walls are covered with Hiler’s vision of the submerged continents of Mu and Atlantis. Brilliantly colored fish, mythical sea creatures, and bizarre, enlarged microorganisms swim and float in the blue-green depths of the sea. Dazzling murals cover the interior walls.. Dazzling murals cover the interior walls, and Hilaire Hiler. Dazzling murals cover the interior walls. Walk through the museum and emerge on the back veranda. Stop a moment to admire the remarkable view of Aquatic Park before you turn around a face the magnificent mosaic work of Sargent Johnson. The green and blue tiles are filled with smiling fish and other fanciful images of the sea. What could be better than a selfie? A caricature drawing! After you gallery-hop head down to Aquatic Park and stop at one of the many artists that line the Wharf and get your own work of art. A great personalized souvenir of the fun and kitschy side of San Francisco’s artistic experience. Backtrack and visit the old Cannery at Del Monte Square when school is in session as a bonus stop on your art walk. Peruse through the gallery on the first floor and head up to the second floor to see Academy of Art students crafting masterful sculptures. Before you hop back on the F-line street car, make sure to check out the newest addition to the Wharf’s public art collection. On the large wall of Taylor Street is a mural created by the students at the Academy of Art to commemorate the maritime history of the Wharf.